The 2011 Chicago Auto Show is less than a week away and today, the Chrysler Group announced that they would be offering a live web feed of new product reveals for the Dodge and Ram brands from the Windy City. Chrysler has not offered any indication as to what we might see from Dodge and Ram but over the past few months (and major auto shows), the Ram brand has been left out of the new model parade. Today’s announcement simply stated that there would be a live broadcast from Chicago during each of the press announcements and with no suggestion as to what we might see next week, we are left to surmise what debuts are so exciting that Chrysler will offer live online coverage. Over the past few months, I have had a chance to speak with a massive number of Dodge and Ram enthusiasts along with the CEOs of both brands. While CEO Ralph Gilles (Dodge) and Fred Diaz (Ram) avoided new product development, the popular rumors in the Mopar world give some idea as to what the consumer would like to see debut in Chicago. The Dodge brand has gone through a complete revision in the past few months with a variety of new and revised models coming for the 2011 model year. At this point, we can assume that anything debuted in Chicago will either be a concept car or a 2012 product – or a new trimline of an existing product. Along the lines of a concept car, perhaps Dodge will offer a first look at the 2013 Dodge Viper…but would they really unveil Detroit's newest supercar in Chicago? Or, will Dodge use the Chicago Auto Show to unveil a new SRT product? I have been lucky enough to see an image of the 2011 Dodge Durango with the hood up and a 6.4L, 392 cubic inch Hemi under the hood so like many people, I expect to see an SRT8 version of the new Durango at some point. Even if it is not in the Durango, I fully expect to see the new 6.4L Hemi in more products so perhaps Dodge will roll out the newest incarnation of the Charger SRT8? The more intriguing portion of today’s announcement is the Ram bran product release. The vehicles formerly known as Dodge trucks have been the only brand from the Chrysler Group not to receive any new model love over the past few months and there have really been no rumors or spyshots to suggest that a new Ram truck is on its way. 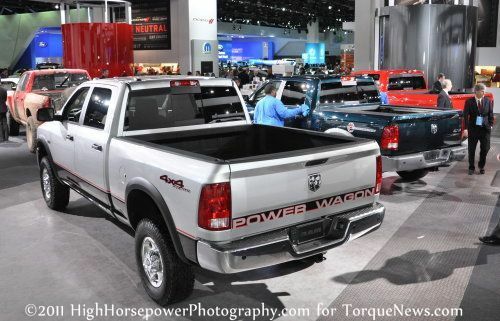 The Dodge Dakota is gone after this year, so perhaps Ram will reveal a new small pickup? There is also the idea of a new trimline or engine offering for the popular Ram pickup lineup. Chrysler has not been shy about offering performance trimlines in their trucks and a new SRT-based Ram truck would definitely turn some heads. Ram could bring out an SRT8 variant with the new 6.4L Hemi or they could give the world a new SRT10 with the Viper engine not currently being used. On the other end of the engine-possibility-spectrum is the light duty diesel. The diesel segment has been hoping for a light duty diesel for some time and with the help of their European siblings, perhaps Ram will offer up a torquey little diesel for the Ram 1500? Engineers at Ford have stated in the past that they had done some work with a light duty diesel but thus far, no one has offered one in the US market. Again, these are just speculations based rumors and hopes from the consumer market but in less than a week we will know what this month’s big news is from the Chrysler Group.